To understand the challenge of root canal therapy, it is necessary to undertand the complexity of tooth anatomy. Because the root of a healthy tooth is made of a highly porous material which oozes fluids constantly when the tooth is alive, there is presently no known technique that can guarantee the total cleaning and sealing of the entire canal system of a dead tooth. Furthermore if the tooth is infected, it is impossible to totally eliminate the infection so root canal therapy can only reduce, as much as possible, the amount of infection in the dead tooth. An infected tooth is thus a more complex problem then it may seem at first glance. A dead tooth, root filled or not, is not a healthy tooth. Even in the absence of infection, the total lack of dentinal fluid transport means that the tooth is always vulnerable to microbial invasion. Conventional root canal therapy is based on mechanical debridement of the canals with antiseptic solutions. The canal(s) are then filled with a rubber based material called gutta-percha and a root canal sealer to try to seal the canal and kill the remaining microbes. Many of these root canal sealers have been proven to be toxic. Furthermore their penetration into the dentinal tubules is limited. After endodontic therapy of infected teeth, microbial infection persist in the root of the tooth and bacterial by-products can continue to access the bloodstream. This is a serious problem as discussed in a recent scientific article published in the International Journal of Endodontics. A strong association between microbes inside the roots and infection around the outside of the root as been shown. Microbes colonise the roots of root canaled teeth and " scientific evidence indicates that unsatisfactory outcome of cases in which treatment has followed the highest technical standards mainly is associated with microbial factors, comprising extraradicular and/or intraradicular infections ". Once teeth are devitalised they become colonised by bacteria. Bacterial infections have been linked with the pathogenesis of autoimmune conditions. Left click here to open the PDF file in a new window or folder. Studies have also demonstrated that bacteria can actually mutate during their life cycle to undergo a quick "identity change" in order to resist the effects of antibiotics.
" Root canal procedures present numerous challenges due to the porous nature of the root structure and ease of penetration of microbes inside that porous structure once the tooth is dead and deprived of blood supply. Currently it is impossible to completely clean the entire canal system of a tooth. 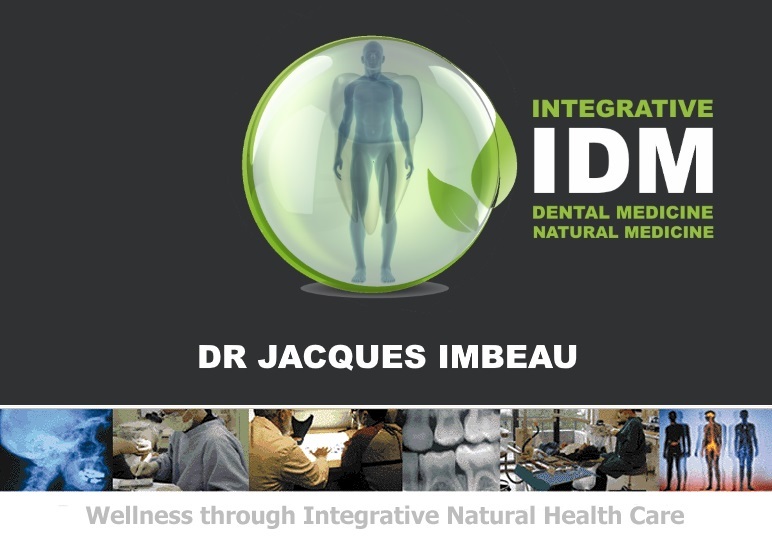 If a dead tooth is infected, it can only be attempted to reduce infection as much as possible within the limitations of present treatment modalities. " REDOING THE ENDODONTIC TX ? 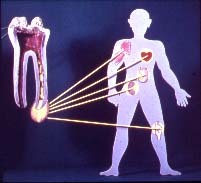 Redoing an existing endodontic treatment is a possible option that may assist in further reducing the amount of residual infection in a tooth, however it is important to be aware of the limitations, taking into account the information provided in the previous section on the challenges of endodontic therapy. The ultimate success rate in getting rid of infected/necrotic tissue in the entire canal system of a tooth will depend on the ability to fully access the dentinal tubules. If the previous endodontic treatment was performed with root canal sealers that are insoluble and/or very difficult to remove and designed to seal the internal opening of the dentinal tubules, it will be very difficult, if possible at all, to get good access to all the dentinal tubules using the photoacoustic effect. Without good access to the dentinal tubules it will not be possible to clean them or seal them using the laser assisted ocalexic procedure explained below. Each situation will vary according to the condition of the tooth, the amount of infection and the type of materials used by the dentist who performed the original endodontic treatment. PHOTOACOUSTIC EFFECT - PIPS : The canal is cleaned using the photoacoustic effect (i.e the production of acoustic waves by the absorption of light in a gas, liquid or solid). This effect is efficiently applied to the debridement of necrotic tissue and debris in the root canal system by using a specially designed Er:Yag laser with Variable Square Pulse technology. These acoustic waves induce a "microagitation" in the root canal system thereby effectively dislodging pulpal and calcified debris and microorganisms from the canal walls. As they gradually rise to the top of the pulpal chamber, they are disintegrated by the laser beam. This process is also described as laser activated irrigation ( LAI ). An Er-Yag laser is also proven to have an effective antibacterial effect with the ability to sterilise infected root canals and infected root surfaces. OCALEXIC EFFECT: Once the infected matter that is accessible is removed and the canal(s) cleaned, the ocalexic material which, like the root structure, is calcium based, is introduced in the canal(s) and a temporary filling is placed to seal the access to the canal(s) and prevent contamination from oral fluids. The ocalexic material has very high affinity with water and will be gradually drawn into the dentinal tubules which may still contain dead cellular matter ( organic matter with a high water content ). The ocalexic material is absorbed by the water in the dentinal tubules and ,in combination with this water, becomes calcium hydroxide ( CaOH2 ), a dental material proven for it's antimicrobial effectiveness and safety in root canal applications. Studies have also demonstrated a greater dentinal tubule penetration by CaO compared to CaOH2. Usually the ocalexic root canal treatment will take the same number of visits as the conventional root canal treatment. Once completed the treated tooth must be monitored to verify the presence or absence of residual infection. This verification should not be limited to clinical ( symptomatology ) and radiographic assessment since these usual modalities may not be sensitive enough to detect chronic infection inside the dentinal tubules. As with any treament modality, success cannot be guaranteed. If chronic infection persist, further treatment to eliminate the infection will be recommended since it is never a good idea to allow a chronic infection to fester in your body. If you need a root canal, talk to our staff to learn more about ocalexic root canal therapy and other therapeutic options available because more than the tooth may be at stake.